In this chapter, we summarise the current thinking about the nature of endocannabinoids. In describing the life cycle of these agents, we highlight the synthetic and catabolic enzymes suggested to be involved. 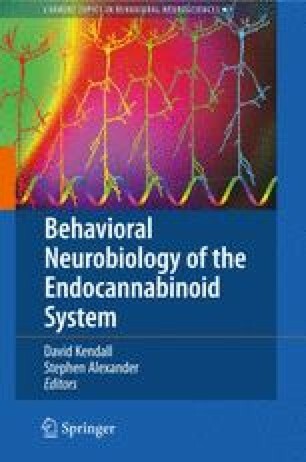 For each of these, we provide a systematic analysis of information on sequence, subcellular and cellular distribution, as well as physiological and pharmacological substrates, enhancers and inhibitors, together with brief descriptions of the impact of manipulating enzyme levels through genetic mechanisms (dealt with in more detail in the chapter “Genetic Models of the Endocannabinoid System” by Monory and Lutz, this volume). In addition, we describe experiments investigating the stimulation of endocannabinoid synthesis and release in intact cell systems.